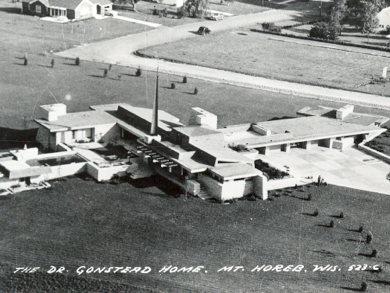 The guest cottage constructed in 1952 was connected to the Clarence Gonstead residence. No distinction was made in quality of construction between the main house and the guest cottage. The original main house, guest house and subsequent pool house were designed by Herb Fritz Jr. in the prairie school style. Three generations of the Fritz family worked for Frank Lloyd Wright. The Taliesin School of Archtecture is located just 30 miles away outside of Spring Green. Hill Top conference center at the entrance to Taliesin was Mr. Fritz’s residence. The main house was destroyed by fire in 1992 and rebuilt around the remaining masonry walls. The original cypress wood and the natural quarried stone colors were lost in the renovation of the main house, but the guest cottage was unaffected by the fire and retains more of the original character of the house. The exterior masonry bearing walls are 2 foot thick clad with random field dressed lanonstone inside and out. Large sheets of glass fill the space between the masonry walls and run to the low ceilings. Vent units adjacent to the large windows emphasize the reoccurring trapezoid theme resulting from the intersection of the sloping walls with the roof. The ceilings are shellacked cypress and floors are quarry tile, ceramic tile and carpet. The original grounds were 55 acres, including a paved runway. Mature specimen trees cover the remaining 2 acre site. Stone walkways and stone retaining walls with recessed lighting enhance the outdoor spaces. The building is heated by an original in-floor copper radiant heating system. A suite of spaces is exclusively yours during your stay including a full kitchen with counter seating, living room, bedroom, and Entertainment/bedroom. The kitchen is equipped with a range, refrigerator, built in microwave and dishwasher. The kitchen is stocked with dishes, silverware, and cooking utensils. One bedroom has a queen sized bed surrounded in stone and wood with a band of high windows. The wood ceilings run throughout the cottage. The second bedroom serves as an entertainment room and has a television DVD/VCR and a queen sized pullout couch. Trapezoid windows on 2 sides run to the low ceilings and look out onto the rear gardens. A phone is provided for local calls and a DSL connection to the internet is available. The living room is furnished with Mission style furniture and faces a lannon stone wood burning fireplace. The utility room is equipped with a full sized washer and dryer. Off-street parking is provided for a single vehicle and bicycles may be stored in the garage. The property is located 3 blocks from the Military Ridge Bicycle Trail, which connects Madison to Dodgeville and beyond. Two upright, wide tire, 6 speed Schwinn Cruiser bicycles are available. The attached garage may be used to secure your personal bicycle. A charcoal grill and a fire pit enhance the outdoor experience. The six block walk to Main Street is like a Norman Rockwell scene with garages concealed behind the houses on small but meticulously maintained lots.